CQC looks a bit more intense this time around and it also looks like Snake can jump now. 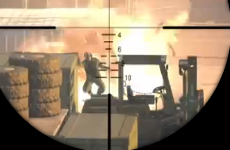 One of the more impressive parts of the gameplay video was the part where Snake is running away from the armored vehicle. He didn't have the heavy weapons required to take it down, but he did have his wits about him. He ran towards the edge of a cliff and then dropped some C4 explosives on the ground where, sure enough, the armored vehicle followed. A perfectly timed detonation caused the vehicle to flip into the air and over the cliff while Snake jumped over, and hung onto, the ledge. There's really quite a few scenarios playing out in the video that show off how much freedom you'll have in Metal Gear Solid V, but this one part single-handedly sold me on the whole idea.